I figured I'd create a thread to post various news stories rather than starting individual threads each time. "Dude, this was, like, 2 years ago..."
Ah, sort of a TWTWTW reincarnation! Yeah, I heard about this and just shook my head -- the lost left doesn't even amaze anymore but they nearly outdo themselves trying. It comes from the top. A POTUS that calls the GOP Budget a "stinkburger" does not exactly set the bar for maturity very high. I thought all of the males at FoxNews liked to be called "dude". Seriously, do you think Vietor is going to answer the question posed to him on the "enemy" network? His answer to the question was cavalier and insensitive at best. On the other hand, he's likely been asked the same question hundreds of times before with the same answer, and his followup response that bureaucrats spend their entire days doing spin is likely correct, on both sides of the aisle. Edit: By the way, keeping this in the news is good for the GOP. Democrats are split 50/50 on whether to continue the investigation, according to a February poll (Fox sponsored), meaning that there is likelihood that some Democrats might consider it an election issue enough so to switch sides at least in the mid-term, and certainly to pull numbers away from Hillary should she get the Donkey's nod for 2016.
do you think Vietor is going to answer the question posed to him on the "enemy" network? Uh, since he agreed to do the interview, Yes. "Hundreds"? I doubt you can provide even ONE transcript from any of these "hundreds" of interviews. Seriously, do you think Vietor is going to answer the question posed to him on the "enemy" network? Fox we would have no idea what's going on. Also, keep in mind that supporters of the ban are the same hypocritical libs who act like marijuana is a health food and want to legalize it, even though casual marijuana use may damage your brain. It always cracks me up how from Joe Camel to powdered alcohol and everything in between the big concern is it might "appeal to children." Last I checked children could not but these products, why would it even matter? Ya hear that, folks? The president of CBS News is the freakin brother of Obama's deputy national security adviser. Also, here's that punk kid Tommy Vietor again. (He's the kid who should be bagging groceries at Safeway, not working for the NSA) Bag boy is blaming Benghazi on Fox News. Big surprise. FYI, this is why conservatives will never win another national election. 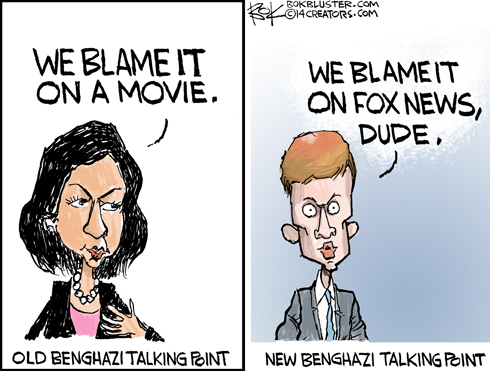 There are enough LIV's out there (remember, 65 million of them voted for Obama after he had wrecked the country for 4 years) who are gullible enough to believe that Benghazi only exists in the minds of conservatives and Fox News. Logical arguments will not have any effect on these LIV's. Callahan: You want to talk about disrespect? I see what you’re writing down there. You just wrote down ‘blah blah blah blah blah’ for everything that Joe Rae said. Joe Rae is a respectable woman. Why are you not respecting her by writing ‘blah blah blah blah blah’ on your notepad? Reporter 2: Mark, we're going to move on. I'm going to ask a question, and if you answer respectfully, we might be willing to endorse you.